Prensa Latina - The declassification of military dictatorship files in Bolivia began Tuesday with the Armed Forces releasing the documents. According to Defense Minister Ruben Saavedra, three days before scheduled, the military institution has allowed Public Ministry's authorities gain access to those documents. Saavedra explained that at 16:00 local time attorney Milton Mendoza and Judge Roger Valverde will declassify the information carefully saved about Luis Garcia Meza' (1980-1981) dictatorship. He pointed out those details will be put at the disposal of judicial authorities to investigate the disappearance of some people under the Garcia Meza regime. Saavedra emphasized that Chief of Staff General Ramiro de la Fuente will hand over the files. 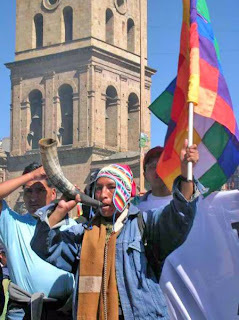 According to the Human Rights statistics about 170 people disappeared in Bolivia during the 19600s, 1970s and part of the 1980s. Among the victims is the founder of Bolivia's Socialist Party Marcelo Quiroga Santa Cruz, who assassinated during the military coup General Garcia Meza spearheaded on July 17, 1980.